Black and white 25mm slogan pin badge. 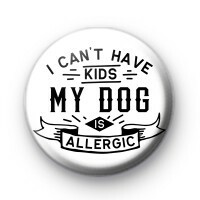 This dog lover badge has the text 'I can't have kids my Dog is allergic. This badge makes us laugh everytime we make it. It is the perfect badge for any dog lover, they do say that a dog is man's best friend. We have lots of fun dog and pet-themed badges in the shop so make sure you check them out too.